This looks incredibly delicious! Not to mention super easy! YES! I am making fettucine alfredo this week with a homemade sauce and was thinking about how good it would be with blackened chicken but didn’t have a the recipe for the chicken part…and now I do!! Thanks for sharing! What an exciting accomplishment!!! Congratulations! Great, easy dinner recipe! Congrats on the recipe being published in MSL. So exciting! I squeal with you! What timing! I have Chicken Alfredo on the menu for this evening so I will try this new recipe. It was a hit with the entire family! My kids even like it. Thanks for a new recipe. wow! you are FAST! I love that you made it already and am delighted that it was a hit with the entire family – yippeee!!! Congratulations Jane! I have that issue but was saving it for this weekend. Am going to read it now! Delicious recipe too! See Jane Go? Go Jane GO! 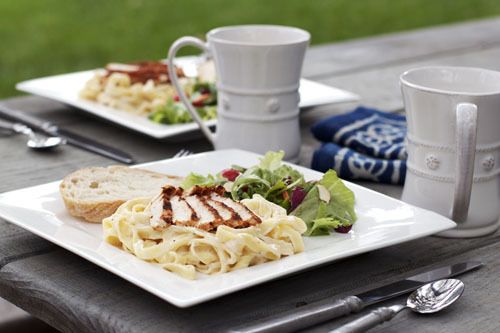 Yumm…I love blackened chicken alfredo. They have it at a local restaurant here and I almost always get it. 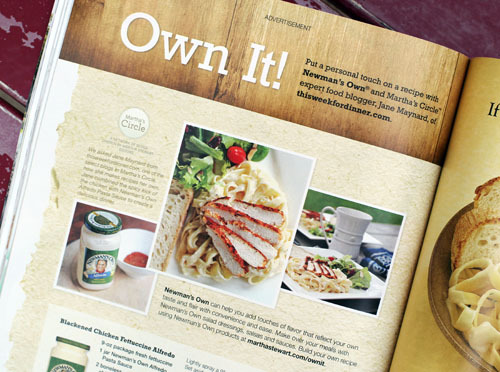 I will have to try newmans owm for the sauce. So far I haven’t found an alfredo sauce in the grocery store that doesn’t have that yucky preservative flavor to it. Congratulations! On a side note, could you explain why the need to put the chicken in the oven instead of just cooking it entirely on the grill pan? Just curious. Thanks! Congratulations Jane! And that looks like a tasty recipe! I will be trying it! Shut up. You’ve arrived! Wait, you already had. Way to go, Jane! Congrats Jane! A great opportuity for you and your blog and such a great reflection on the whole blogging community. Yippee! As for learning to love spicy — you might get addicted. Step up the chipotle the next time you make tortilla soup – you might just love it. Love this recipe because it’s different but with the shortcut of using Newman’s sauce, it’s still doable on a weeknight. Made this tonight and it was great! My husband raved! I’m so thrilled for you, Jane, and not a bit surprised. You are incredible–fabulous recipe! I am so thrilled for you, Jane, but not a bit surprised. You are amazing–congrats! The recipe looks great. Congrats!! This is awesome and this recipe sounds amazing! I can’t wait to try it! oh jane, i’m so proud of you! 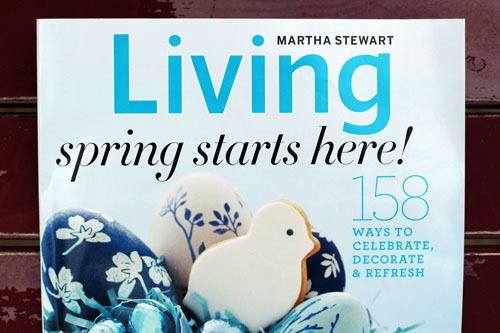 i’m going to have to buy an issue of martha now, so i can go around bragging about you! 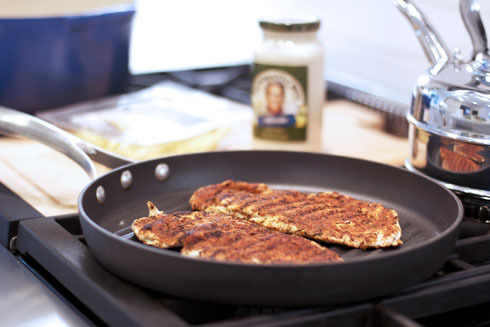 hehe… your recipe made me miss chicken and dairy (i’m trying out a vegan diet for lent). after easter, once i go back to my vegetarian diet, i’d love to try out your recipe using mock chicken. i’ll let you know how it fares. love from the LV. Yumm! That looks delicious and very easy to make. Thanks for sharing! Soooooooo Awesome! Congrats. That recipe looks super yum! Way to go! This looks delicious, can’t wait to give it a try! WAIT! WHAT? I just saw this now. You are now an even bigger hero for me. GO JANE!!! I just made this and it turned out perfectly. Thank you so much for the wonderful recipe! Wow! 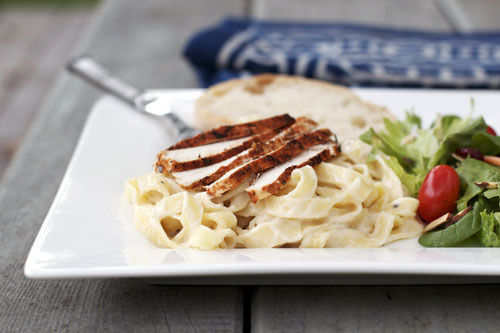 Blackened chicken and alfredo pasta are two of my favorites and I was wondering if I could combine these into a dish and found your receipe. Thank you so much!!! I would for sure double all the spices for coating on the chicken. This Chicken recipe is not good. did you make the recipe and have trouble with it? let me know, would love to help out! so far we’ve had a lot of success with the recipe, but love to get feedback. thanks! This is one of the best chicken alfredo recipes I have ever had! My husband and I both loved it and will definitely make it again…so easy too! thanks, jessica! so glad you guys loved it! What temperature does the oven need to be on or did I miss that. Thanks! Made is for my husbands birthday, turned out great..but watch out with the cayenne, I just added a pinch. This was AMAZING. So, so good. Keeper. Congratualtions on your magazine feature. This recipe looks delicious, I’m sure the super spicey flavor will be a hit in my house.Thanks for sharing. This recipe was awesome! My wife doesn’t really like spicy stuff, either, so I’ve been trying to find a recipe for Chicken Alfredo that wouldn’t turn her off to it… And after MANY failed attempts :^P , I’ve finally made her something we can all enjoy (even my 3-year-old!) … All thanks to your recipe! Congrats on being published; you totally deserved the recognition! Way too hot. Tasted more like chili seasoning on the chicken. I was thinking it would have a more blackened flavor. Tasted too much like chili. Kids didn’t like it. Husband ate it though. 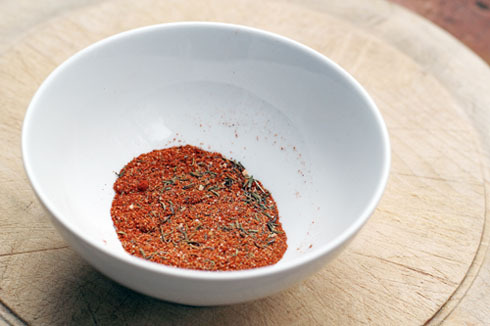 I love this recipe I have been cooking for several years and have never came up with the right seasoning mix for blackened chicken. I absolutely loved it. I have been in a relationship for 2 years and he never knew I could cook (because he has been overseas) until on our anniversary I told him I would cook for him for the first time since he have been back from the military. To make a long story short I am now ENGAGED!!!!!! Sounds wonderful. Can’t wait to try it. Having company over next week and will have thiÃŸ for sure. I am so glad the technique worked perfectly for you – thank you so much for letting us know!